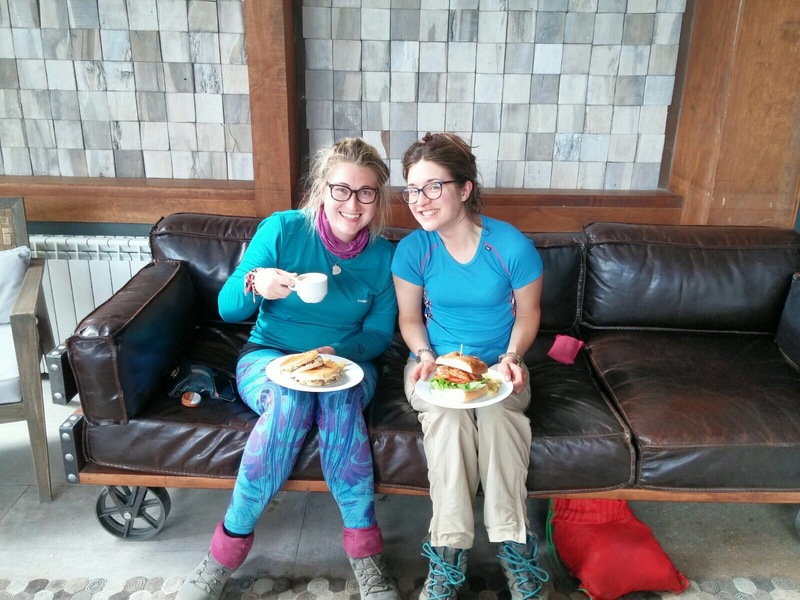 Find Danielle’s account and George’s insight of the W Trek here, in one rather long blog post! Enjoy! I am sure many of you have heard the phrase ‘so-and-so has learned to walk’ excitedly exclaimed from your parent-friends. Well, now I am going to excitedly exclaim the same: ‘George and I learned to walk!’ I can now officially claim to know this skill in the same way as those hardened hikers who, when they say ‘walk’, mean ‘backpacks on, camping stoves packed, scrambling over rocks in any weather’ kind of walking. We have learned to walk. 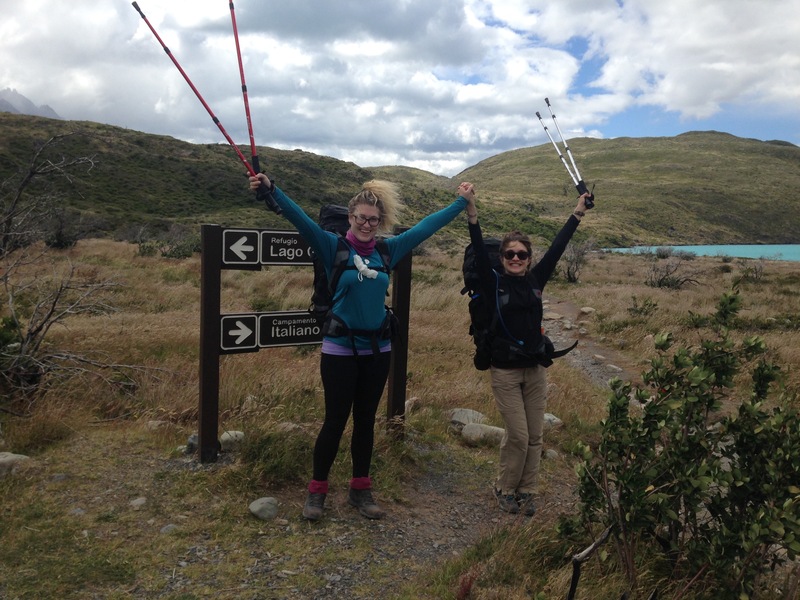 The W Trek, Torres Del Paine, Patagonia: a hiker’s dream to which many seasoned trekkers come from all over the world. And George and myself kind of stumbled across it and said, on a whim, ‘let’s do it’ in a ‘well, why not’ kind of way. We started by going to one of the free talks detailing the well-known hikes of the area, with the sole view of doing perhaps one day of hiking, and two at the very most. However, the guide was so enthusiastic about the trek that we both left feeling a little more curious about the full ‘W’. I won’t claim to have been suddenly turned around on the subject, knowing my hiking skills are, well, zero to none (or, at least, they were). But after much toing-and-froing, in a very casual manner, we decided to go. So we spent the next day organising ourselves with everything we would need for the full 5-day trek. We cannot claim to be fully fledged hikers quite yet, as much as we would like to think ourselves so. We mutually decided, with no discussion needed, that carrying our own tents and sleeping bags might be a little too much on our first real foray into the trekking world. Don’t get me wrong, our backpacks were heavy enough with our five days’ supply of food, clothes and first aid equipment; we just thought it best to stop there on this particular occasion and not overdo it by attempting to carry the weight of our sleeping gear as well. So, with our tents at each camp booked, our buses to the park sorted and our meals carefully measured out and packed per each day’s requirements, we were set to go. After an early start and a long bus ride to the park, our hike did not kick off until early afternoon. And boy, was it a baptism by fire! To say it was windy just does not even begin to scratch the surface. And so, after roughly 5 hours of walking, we reached our first campsite. Our tent was set up, sleeping bags ready and all that was left to do was get our camping stove and dinner and get cooking. 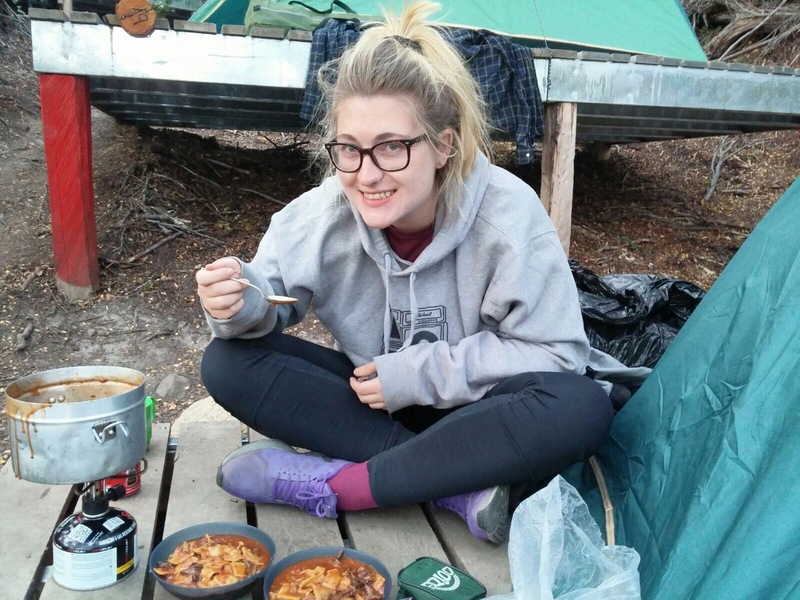 On the menu for our first night (as well as every other night in some variation) was pasta (or ravioli on our posh nights), powdered soup for sauce and a rather large serving of dried onions and powdered garlic. Surprisingly, and despite the cold and sloped ground we slept on, we had a pretty good night’s sleep – as we would find every night due to the exhaustion of the many hours walking per day. One thing that added to the wonderful sense of being at one with nature, was that all the water in the park is drinkable. 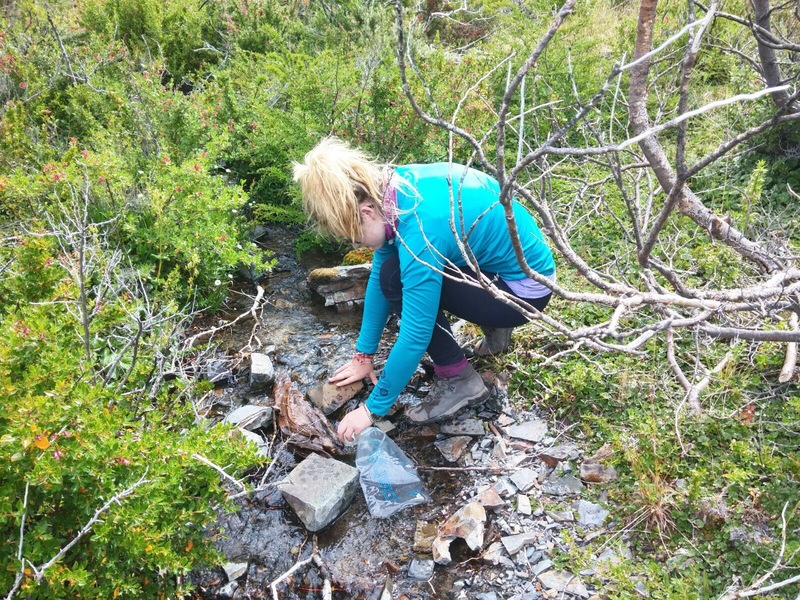 When we ran out of water, we simply filled up our water bottles at the next stream we passed. Bliss. One of our longer days, Day 2 saw us retracing our steps back down the first length of the ‘W’ and continuing along the bottom, culminating in a 10 hour day. Luckily for us, the wind had died down a little and the sun was shining! Now this brings us onto the most difficult day; it rained, it hailed, we slipped, we fell hard, and we reached the summit to see only clouds for the few seconds we managed to fight the wind, before we swiftly headed straight back down on wet and slippy rocks. 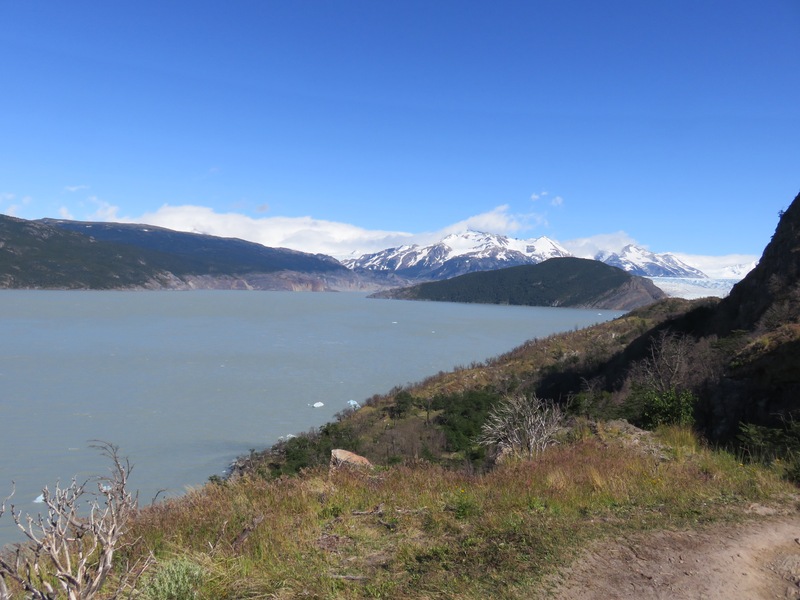 In hindsight, this was a funny day and I am glad we were able to experience the great variety of weather Torres del Paine National Park is infamous for. But, at the time, I was a little miserable, a bit wet, and a lot scared of falling over! As my previous post would suggest, I had reason to be nervous of falling and injuring myself, based on past experience; however, George completely surpassed me in that respect on this trip! It did give us a lot of laughs though (of course, only after I had checked she was ok…briefly). This was our most enjoyable and rewarding day! 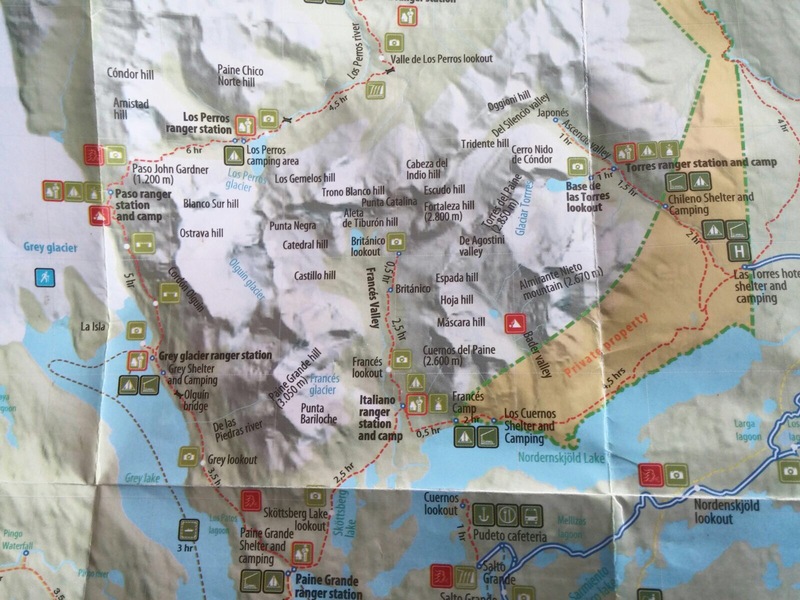 Firstly, it was only 6 hours of walking – the time it suggested on the map! It was the first day we managed to hit the recommended time dead on – we were somewhat slower the preceding days. This meant that we reached our camp for the night at just 5 P.M. (three hours earlier than previous nights), were able to have an early dinner and, even better, an early night! Bliss! But not only that, the sun was shining on us all day and the scenery was beautiful. We even had an idyllic lunch spot at the edge of a river with small birds and butterflies flitting around us – truly a fairytale-like scene – despite the fact that, far from princesses, we were a little stinky, rather muddy and singing crude Book of Mormon lyrics in between bites of our now 5-day-old wraps – somehow we still found these appetising. Night four was mushroom night – a highly-anticipated dinner of pasta with dried mushrooms and mushroom sauce (soup). Whenever it was mentioned, one of us would throw in a godawful pun, but there isn’t mushroom to list them all here (sorry). However, we decided to save them up for what had now become ‘mushroom pun night’. As we added the dried mushrooms to our pot, Danielle kicked off proceedings with a shocker: “There’s no more room for these mushrooms!” Utter fail. But utterly hilarious. On this day, we had the option of waking up at horrendous-o’clock, setting off pre-3 A.M., and walking two and a half hours uphill, in the dark, to witness a beautiful sunrise over the Torres (Towers) from which the park gets its name. Needless to say, we opted out of this dangerous trail, knowing full well from our previous days that we would likely injure ourselves at the least, and possibly fall off the edge of a mountain at worst. Luckily for us, a cloudy sky meant that the more eager trekkers informed us that the clouded view of the sunrise was in no way worth the early start and we were smug in our decision. So we set off about 10 A.M. for our final summit. But on the final push down to the end of the trail, the musical games came out again and my spirits, and George’s, were saved! In fact, I’m pretty sure we practically skipped down the last 2 hours! And what a treat we had in store when we reached the finish line! Toilets in a 5-star hotel! Lunch and coffee in a 5-star hotel. And the judgemental looks that came with two smelly backpackers invading the tranquility of the guests of said 5-star hotel. But did we care? Erm… NO! Despite my somewhat hesitant ‘let’s go’ when we initially decided to do the full W Trek, I could not be happier or more proud that George and I managed to complete the 5 days with no hiccups, aside from a few minor injuries and sore feet. Our first real do-it-ourselves hiking experience was a resounding success. And we now own our own hiking poles so, clearly, we are committed to doing more! Thus, don’t be surprised if you see me rushing off for weekends in the Lake District on my return – I am a changed woman. No, you should still be rightfully surprised – I don’t think I am quite there yet. But I have been bitten by the walking bug just a little, so, who knows? Watch this space! < Previous Christmas On the Road! 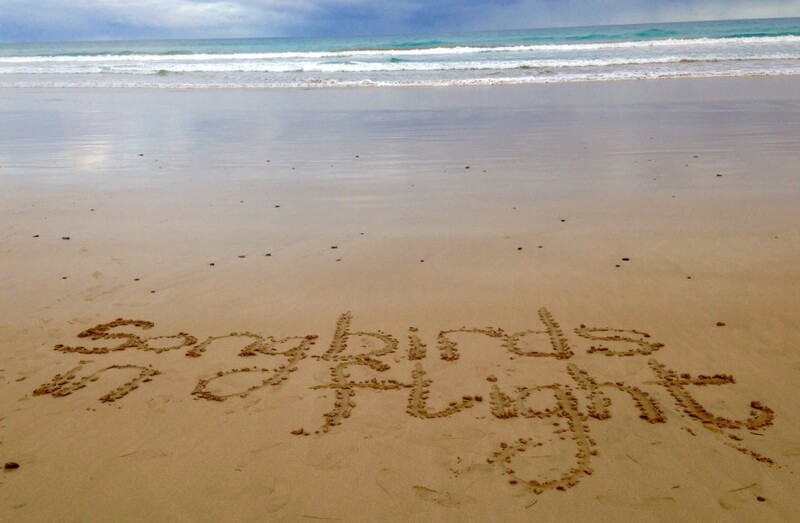 Brilliant blog post, girls! I was truly gripped! 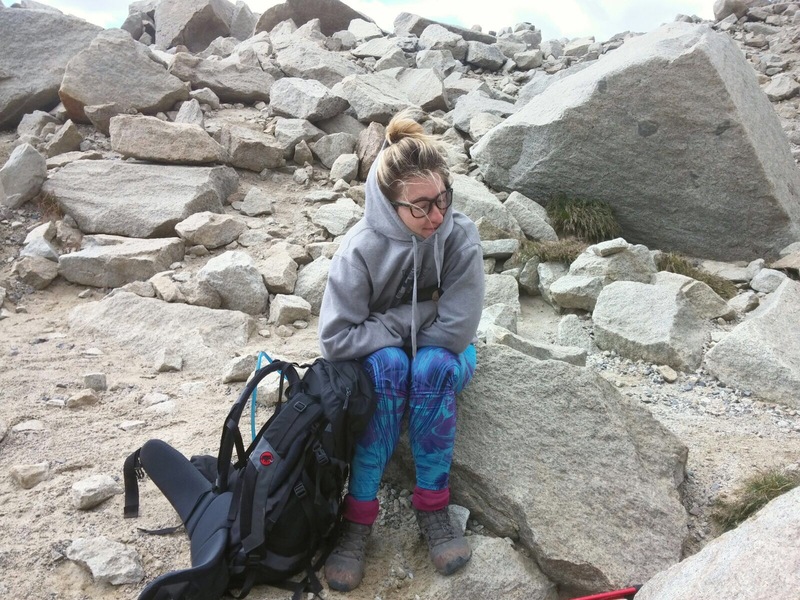 Congrats on completing what sounds like a gruelling 5 day trek. Very much worth the hard slog, though. Hope you get some r&r at your next stop! Emily McGonagle on W is for… Walking! Emily McGonagle on Christmas On the Road!